I don’t understand why Portland doesn’t just stripe the bike lane through the intersection using hash marks. Seems like that’s the obvious solution here. Drivers don’t know the laws, but visible stripes make it more apparent to them that they are crossing another lane. Cost? It’s literally just paint. Is PBOT’s budget really so tight they can’t afford a pair of striped lines on the pavement? Probably costs a couple thousand dollars per intersection to send a crew out to paint stripes. How many intersections are crossed by bike lanes in Portland? I can’t believe we have to have a debate over the cost of painting stripes on the street. How ridiculously broken is our transportation system? I really don’t think it’s all that bad. 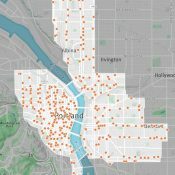 We obviously have a severe shortage of bicycle facilities, all transportation infrastructure is lacking in East Portland, and an awful mode split that is heavily skewed to SOVs. But eliminate the massive amount of traffic that flows from Clark County into the Portland Metro area on a daily basis and the excessive wear caused by studded tires, and we wouldn’t be that bad. I’ve seen serious street deterioration caused by long term underinvestment in maintenance in Michigan. We are nowhere near that level, despite the constant grousing about potholes by Portlanders. Doesn’t PBOT have the authority to ban studded tires on the streets under their jurisdiction? I’m pretty sure that PBOT does not have the authority to ban studded tires. That would be on ODOT. And even if PBOT did have the authority, it would be very difficult to enforce at a City level. Our police staffing levels are so low that they are perpetually in crisis mode. Cops can barely enforce speeding and basic traffic safety issues. They would put studded tires so low on the priority list that it would not get enforced at all. i think it’s a bit more complicated than simply cost. My hunch is that lines aren’t drawn in intersections because all the turning movements would make them wear away very quickly. This would require frequent maintenance and it would give cities legal exposure if/when a crash happened. So instead of going through all the maintenance costs (which are not just paint, think about paying unionized work crews that have many other jobs on their list to do), cities opt to not paint anything at all. there’s also the issue that lines painted through intersections can create confusion for users. Can u imagine a bunch of lines in different directions? it would get confusing quickly, and the last place you want confusion is in an intersection. Then why does PBOT build those confusing green crosswalks that don’t align with the road? Because it’s okay if we confuse bikers, but not cars? Why not instead spend the money on striping bike lanes through intersections where it actually makes sense? I know things are different in Oregon, but intersections are most often where cyclists leave the bike lane to pass right-turning cars on the left, or even take the lane slightly in advance to prevent right hooks (effectively allowing/forcing the driver to merge/yield). Striping the lane through the intersection is contrary to that manner of riding, and communicates the expected projection of the cyclist to remain to the right of traffic flow, and any right-turning drivers the legal due diligence of (hopefully) yielding to the cyclist. Then why does PBOT build those confusing green crosswalks that don’t align with the road? Because it’s okay if we confuse bikers, but not cars? there were likely similar complaints about crosswalks when they were first introduced. it’s my experience that people driving increasingly cede right of way at cross bikes. i’m a huge fan of this kind of “confusion”. It’s not paint. It’s torch-down thermoplastic. Higher cost both in materials and labor. Not exorbitantly, but more than just paint. It could be paint if they wanted to really do it on the cheap. But they’d have to repaint more frequently. Pretty sure they use thermoplastic specifically because it’s supposed to last longer and is more visible than plain old paint when wet — ultimately the ROI is better because it doesn’t have to be touched up as often. Literally just paint that needs to be reapplied, repeatedly, as vehicles drive over itand wear it away. You’ve got the cost of the paint itself, plus the labor costs to get a crew out there to paint and put down the reflective beads, and don’t forget the crew that puts up the signs warning of road work ahead and the cones and flaggers. And don’t forget also the road sweeper that needs to go through first to clean the surface so the paint adheres correctly. You must live in a bubble if you think the only cost of striping is the cost of the paint on the first application. I can’t find it in their manual but I recall one of the reasons is that it’s ODOTs opinion that too many crossing lines in an intersection can cause confusion so they generally avoid continuing them through the intersection unless there is another reason like multiple turn lanes. It’s been proven that confusing intersections cause people to slow down and enter more slowly and carefully. So, bring on the conflicting lines! What if you’re hit between hash marks? thanks for this important information. This seems non-controversial and like a total no-brainer, but you never know. Is the Street trust seeking support for this- emailing our representatives or something? The Street Trust is doing leg work now and will organize public support for the bill in January. No harm in letting your state rep and senator know your interest in the bill now! Kudos to Representative Rob Nosse who reached out to Ray Thomas and The Street Trust when he was contacted by a constituent about this issue! We were just starting to plot a legislative strategy when Rep Nosse volunteered to sponsor the bill. Let him know you appreciate his support for the safety and protection of cyclists! Awesome! I’m no longer a constituent, but Oregonians have SO much to thank Ray Thomas for. There is a downside to this proposal. Many cyclists who understand that being in a bike lane at an intersection where motorists can and do turn across the bike lane is an unsafe practice. If this proposal passes, a rogue cop may choose to cite us for taking the lane adjacent to a bike lane. Sure, we may be successful fighting such a citation in court if we can get the judge to understand the high risk of being in a bike lane to the right of right-turning traffic (or to the left of left-turning traffic), but that wastes a lot of time and, since few if any traffic court judges know how to ride bicycles, has low odds of success. 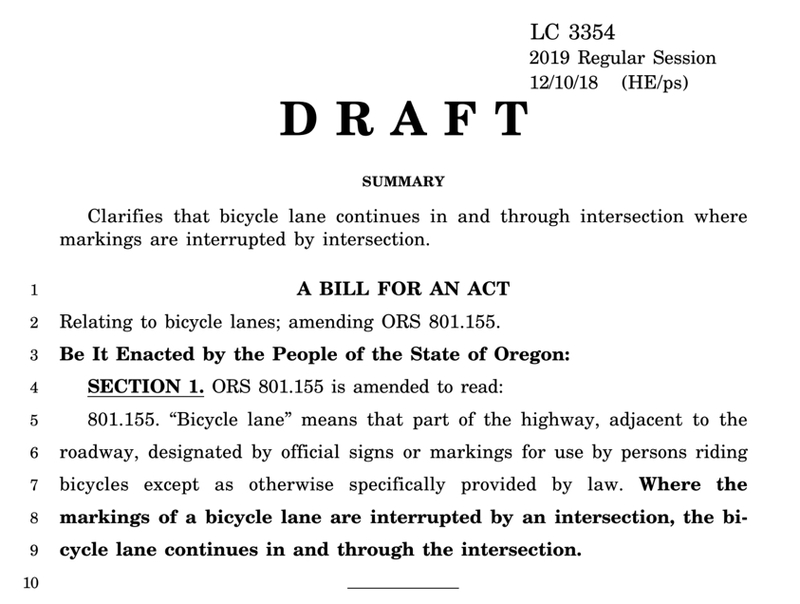 I’d love to see this issue addressed by a modification of this proposed law to explicitly state that cyclists can still abandon the bike lane to avoid right hooks or, better yet, use these court decisions to catalyze the removal of Oregon’s terrible mandatory bike lane use law. Shhh… this is BP, where you’re supposed to just accept the increased risk in which you have been placed so that other people can be tricked onto bikes. As I said above Oregon law is different, and I suspect it’s more the exception than the rule, or at least that many other states lack the clarity that the California law has (on when bikes leave the bike lane). Also I know we’ve been through this topic a million times here on BP so I’ll disclaim: I’m not saying cars merging rather than yielding is better, it’s just more common where I’ve ridden outside of Oregon (and the law in California). One anecdote where the rider chose to challenge a cop that decided to give him a ticket for giving him lip. Okay. What else? Ooh. Another anecdote form Los Angeles. What is that, 666 miles away from the Oregon border and more than 1,000 miles from Portland? And if a cop is going to do this to a rider near a bike lane at all, what difference does the intersection clarification to the law make? Geography is irrelevant. 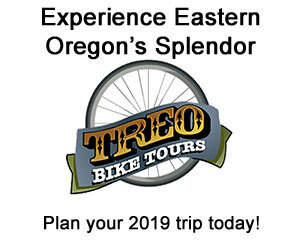 I know there are many cyclists in Oregon who can give you anecdotes about encountering police officers (Portland and elsewhere) who misunderstand why bicyclists ride in certain manners that may be interpreted as ‘unexpected’ or ‘illegal’. I happen to agree with B. Carfree’s point that once you put the paint down you communicate an expectation that may be misinterpreted by anyone, and even worse, by police, who don’t always have the best track record of understanding bike law (just ask Ray). You’re free to disagree with both of us; no harm, no foul. The difference that the clarification makes is exactly as Ray stated: two misinterpretations is too many. This law is not about putting paint down, I don’t know why you’re fixated on it. It’s about clarifying that lanes do continue across the intersection so that a cyclist in a bike lane gets right hooked by a driver without a turn signal on (the president that created this conundrum in the first place) they will be protected explicitly by the law. The law also allows me to leave the bike lane (no matter where it is) if a hazard necessitates me doing so. Sure, cops might abuse and misunderstand that law, but as a general rule they don’t. And anecdotes don’t matter — collective data does. I can give you one where I cop pulled me over to hassle me and when I started demonstrating that I knew exactly what I was talking about regarding the law he backed off. Still, it’s an anecdote, doesn’t matter. Anecdotes are people sharing experience, which is why I still follow this blog long after I moved away from Portland. I’m not fixated on paint in intersections; it was a proposal someone else brought up that myself and others disagree with. The last anecdote I sent you was an example of the kind of behavior B. Carfree mentioned, leading to the kinds of courtroom conversations and decisions prompting Ray into action here. Where Oregon’s law falls short (I believe) is by not explicitly stipulating the common situation where cyclists take the lane (i.e. leave the bike lane) to either pass a right-turning car or prevent one from passing before turning. This is even further clarification beyond what Ray feels he has to address here; Oregon’s laws still need more work. Anyway, thanks Ray for your decades of tireless advocacy on our behalf! I’m unclear on your concern. The clarification only affects where there’s a marked lane up to the intersection. In your scenario you’re taking the lane prior to the intersection as well–right? So the risk of legal citation is that the cop didn’t mind you taking the lane there, but cites you for taking the lane in the intersection? Seems far-fetched. 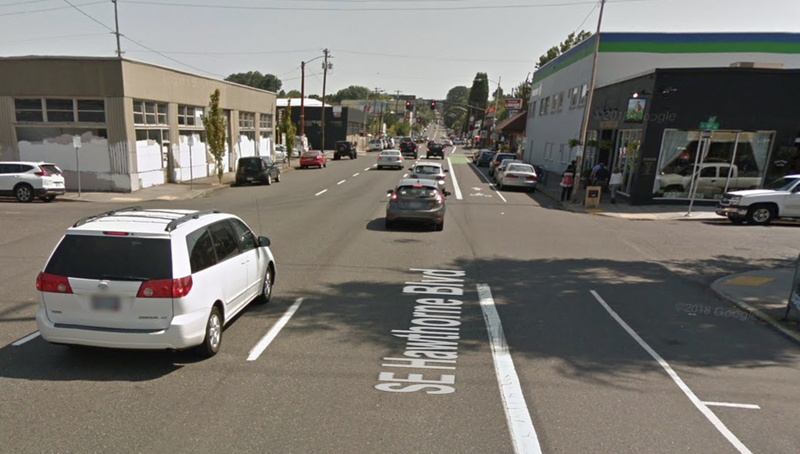 So in the above example on this page (eastbound Hawthorne St. in heavy traffic) you would merge into the RH vehicle lane at every single intersection? In the pictured intersection the bike lane is away from the curb because of the parking spaces, and it appears there may even be a no parking section up to the turn. It should appear obvious that the cyclist’s right of way is a straight projection across this street – to Ray’s point, apparently two judges didn’t believe so. In many states the turning driver would use the bike lane and even corner space to make the right turn, rather than turning almost 90-degrees across the cyclist’s projected path. It’s in these situations that I frequently will either use my drop-bar mirror to signal and take the lane in front of a signalling driver, or stay the course if there doesn’t seem to be a right-hook risk. How far in advance of the turn that I’d take the lane would depend on speed, traffic density, etc., but it could be up to 100′ in advance by the laws of my state, not yours. (Also, the lines wouldn’t be solid up to the turn, they’d be dashed to indicate I might come over, and that if you’re in a car turning right you should start moving to the right – after checking the bike lane is clear, of course). Again, I’m not saying one way is better than the other, it’s just what I’ve gotten used to since the long-ago days when almost all my cycling experience was in Oregon. Ah, you beat me to it, I just didn’t read down far enough. In addition to enforcement, my point was just that paint communicates a message, especially to drivers because a cyclist who views this movement as normal (sounds like you and me) would be seen from behind the windshield as performing something ‘unpredicted’. On the language, I think California addressed this appropriately in CVC 21202 section 4. In California the solid line typically becomes dashed 100′ in advance of the intersection, partly to communicate to drivers that the cyclist may leave the lane (in addition to telling them they can ‘breach’ the line to merge). Absolutely. I’ve read Ray’s book and learned from his classes and lectures, and I’m sure anyone with significant cycling experience gets it. 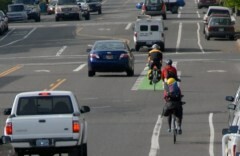 Most drivers tend to believe bicycles only belong in marked bike lanes though. Heck, even some of your judges don’t understand! You placed a lane to the right of a lane which can turn right. No amount of legislation is going to fix that failure. How is that any different than a crosswalk? Precisely why we should have No Right on Red and LPI signals. los angeles makes increasing use of scramble intersections. imo, this is another obvious way to create safe intersections for people rolling or walking. portland has one of these — and it’s poorly implemented. Is it still illegal on a bike if you jog over into the crosswalk? Bikes in crosswalks are generally perfectly legal, and a great way to demand right of way from cars. This is another area where I wish we had better normalization across states. Oregon law is relatively clear on expectations. In California it’s a commonly-held belief that it’s illegal to ride a bike in a crosswalk (just ask Stan Roberts), and when I studied for LCI in California I learned (from a Sheriff’s bike patrol coordinator) that it’s highly frowned upon there because you lose your status as a pedestrian, and judges generally consider pedestrians as having the utmost right of way on the road. The general instructor consensus was that if you’re not going to cross the intersection by bike in a lane position, then you should unmount (and for practical matters I don’t agree with that). There is no law stating it’s illegal though – or legal. Had to look that one up, thanks – “scramble intersections” were the norm when I was growing up on the east coast, but then ago those were days when lights were longer and traffic lighter (and pedestrian safety generally kind of a big thing). It’s the rights on green that are the problem here. Ultimately what it comes down to is that turns need their own light phase, no turns allowed outside of that phase, and every intersection with a bike lane needs to be signalized. Ain’t gonna happen. scramble intersections would solve this conflict entirely with virtually no added expense. It’s not. That’s why JeffS refuses to use any crosswalk that crosses at an intersection, calling them “failure-walks”. So we should never have bike lanes, is what you’re saying? Making it illegal for motor vehicles to turn across bike lanes should work just fine. For clarification (out of curiosity), are you advocating for cars merging into the bike lane before turning (ala California) and not the car staying out of the bike lane until they get to the intersection itself (ala Oregon)? I can think of many examples of two lane turning setups and I don’t see folks in cars struggling to navigate the infrastructure. I don’t always like being sandwiched between motor vehicles and the curb either, but what other designs could be used in the bike lane/intersection scenario that would be safer, Jeff? Motor vehicle lanes are rarely striped through intersections and somehow drivers seem to understand they can’t just jump into another lane that’s already occupied by another vehicle. Clarifying this in the law will be a good thing for all road users, in my opinion. probably splitting hairs, but in some cases there is a bike lane leading into an intersection, and magically none on the other side. “Interrupted” could be construed not to apply in that case, which would be unfortunate. Kelly actually makes a very valid point. In NYC, it’s common practice to paint the sharrows all the way across the intersection, bounded on each side by dotted lines. (Also common practice in Paris, France.) This would carry out the intent of the proposed law. I’m surprised this isn’t common style elsewhere in this country. Los Angeles, for example, with its many wide intersections, should do that but doesn’t. Portland has been doing this with green striping on major intersections that are crossed by bikeways, as well. But there are tons of intersections that haven’t been painted. Retrofitting thousands of intersections would be costly and would take a long time to accomplish. Changing the law could be done quickly. Plus, it was a Deschutes County court that tried the case that prompted the drafting of this bill. 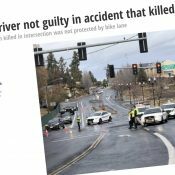 The fatal crash occurred in Bend. 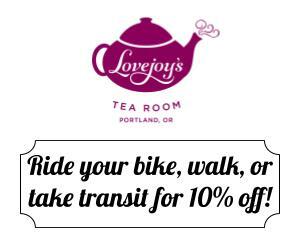 While the majority of Oregon bike lanes happen to be in Portland, there are many that are in other parts of the state. Simply fixing Portland’s bike lanes will not fix the legal loophole that was used by the judge to get the truck driver off the hook for killing a cyclist. Time to replace some judges! I think in the driver’s manual, it says not to carry out a lane change in the middle of an intersection. This implies that, while car lanes aren’t drawn in the intersection, they exist. Any judge who would defer the rights of cyclists on the basis that lanes disappear in an intersection clearly has bias. Great point, Jason! When I first read about this verdict I had a similar thought: If we applied this logic to all vehicles just imagine what a mess it would create. Seems to me the end game of this judge’s logic is a free-for-all at every intersection with no real legal guidance to assign fault in court. Thanks, Ray, for taking the lead on this. For all BP readers: It will be really important to contact your legislators, and all member of appropriate committees, when the bill is introduced. Definitely thank you, Ray Thomas, for trying to get this through. It’s sad that we need it, it appears that the “spirit of the law” only applies to some things but not to bike lanes. It’s clear that the intent of the bike lanes, especially ones that continue on the other side of an intersection, are to exist through the intersections like the rest of the traffic lanes. The two judges who decided bike lanes don’t exist in intersections clearly don’t understand the spirit of the law, and also common sense. Fingers crossed it passes– it’s almost dumb enough not to (as in, people will say, “duh, of course they exist in intersections, we don’t need this”). A related question: True or false? If an operator of a motor vehicle in Oregon strikes a cyclist (or pedestrian) with the vehicle, the most the operator can be charged with is a misdemeanor – as long as the operator stops the vehicle, renders aid, cooperates with police, etc. The operator can be charged with a felony *only* if the operator fails to stop. Is that true? It’s what a friend and fellow cyclist, who was struck by a vehicle and injured, was told by someone in the law-enforcement world (police, DA’s office, etc). In his case the driver fled (hit and run) and was therefore charged with a felony. I’m wondering if a reader has experience with this issue, or whether it has been discussed before, here on BP or elsewhere (share a link, please). Thanks. Hang on: the way I read the statute, the statement is essentially true. The felony is *aggravated* vehicular homicide, and it appears the bar is very high indeed. I’d like it better if they removed “by an intersections,” from it. That way any gap in the bike lane markings is covered.